Erin Monyek is an attorney and former owner of the Glenn Law Firm P.C. in Colorado Springs, CO, which specializes in divorce and custody cases. She has been in private practice since she got out of the United States Air Force JAG in 2002 where she primarily practiced criminal defense law. She has a Bachelor’s Degree from UMASS Lowell in Political Science and a Juris Doctorate from New England School of Law in Boston, MA. She is also a licensed Realtor in Colorado. Liz Schulze is a Chief Financial Officer for Mobility Services International which is a global mobility solutions company. She has worked out of the Denver office since December 2012 and out of the Portsmouth, NH office for the prior 16 years. She has a Bachelor’s Degree in Accounting from Boston College in Boston, MA and a Master’s of Business Administration Degree with a concentration in finance from Bentley College in Waltham, MA. Erin and Liz are identical twin sisters who grew up on the east coast of Massachusetts where there is a Dunkin Donuts on every corner. They are from Gloucester, MA where not only is there a Dunkin Donuts on every corner, but also specialty Italian and Portuguese Bakeries all throughout the town that have amazing donuts and baked goods. Erin and Liz’s first job was working at their grandparents’ bed and breakfast, The Williams Guest House, in Gloucester, MA when they were twelve years old. They worked there every summer and weekends during the beach season for five years as chambermaids and breakfast bakers. During this time Erin and Liz perfected the art of making muffins. Their grandmother continued to run the bed and breakfast without her skilled muffin makers until 2014 when she passed away. Guests returning to The Williams Guest House have continued to talk about the muffins made by Erin and Liz even thirty plus years after they baked their last muffin in Gloucester, MA. One of Erin and Liz’s hobbies as teenagers was baking and cake decorating. They would always supply all of the family gatherings and holiday parties with beautifully decorated cakes and creative baked goods and even make a few extra dollars baking and decorating cakes for people in the neighborhood. Erin even went on to start her own custom cake and catering business when she was in her early twenties. Her business was wildly successful and she had more business than she could handle. Erin and Liz are both highly educated and motivated people who felt the need to do something with their lives that they considered important and successful. Ultimately, that is what led to Erin closing her cake business and going to law school. Now, after both Erin and Liz have experienced the success of the professional and corporate world, they want to do something different with their lives. Erin decided to stay permanently in Colorado Springs after getting out of the Air Force in 2002 because her husband at the time (she is now divorced) was involved in local politics and her two daughters aged 25 and 27 now, were happy here. 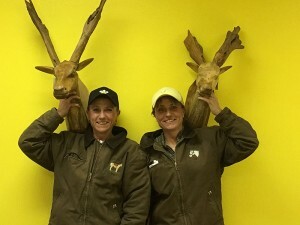 After being separated for a good portion of their professional careers, Liz was able to relocate to Monument, CO so that the twins could be reunited for the rest of their lives. At that time Erin and Liz began to seriously talk about starting a business together. While the discussions were still ongoing, Erin and Liz began a routine of going to spin class together at the YMCA every Friday morning before work and then testing out a different local coffee shop for breakfast. They continued to come to the conclusion that the donuts, pastry, and coffee in Colorado were really awful compared to Massachusetts. They also continued to host many large dinners with their family and friends who were visiting at the time. Many of those gatherings ended with comments from everyone that they should definitely start their own bakery. Another one of Erin and Liz’s hobbies has always been horses. 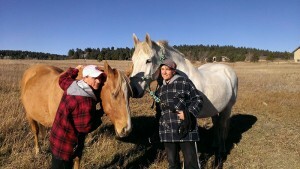 They had a horse growing up in Massachusetts and now own five horses together in Colorado. Recently their Mom joined them in Colorado and added two more horses to the mix! They thoroughly enjoy the Colorado “Western” culture and everything that Colorado has to offer. They are avid hikers and own seven dogs between them. Erin and Liz finally visited VooDoo Doughnut in Denver, CO after so many terrible coffee and donuts close to Monument and Colorado Springs. They loved the concept of this place but somehow knew they could do this and even do this better! Consequently, Horseshoe Donuts LLC was born! Horseshoe Donuts will have delicious donuts and specialties with a horse, Colorado, and western theme. It will also have great coffee. Coming into Horseshoe Donuts will be a complete western experience for consumers! All of the décor and furniture will make the customer feel like entering the Wild, Wild, West! Our shop is going to eventually be a tourist destination for consumers much like VooDoo Doughnut is in Denver. However, our products are going to be fantastic. They will be made from scratch and better than anything you ever tasted west of the Mississippi! You might wonder why a successful attorney and chief financial officer would want to start a donut shop. Well, that is simple. Donuts make people happy. Divorce does not. The corporate world is stressful. Donuts are not. Erin and Liz want to do something together that they start from the ground up and make it soar! They are both very successful, smart and have diverse experiences from their educational and professional backgrounds that blend well together and will foster and nurture their business venture. Erin and Liz have never been afraid of a hard day’s work! They have both been very successful individually. However, if you know anything about identical twins, you know that although they can be great on their own, they are even greater together. Together, Erin and Liz are going to create, make, and grow Horseshoe Donuts to be the best and most successful donut and coffee shop in all of Colorado! And, they are going to have the satisfaction of doing this together! This is the story behind the big white horse in our logo. One day I was walking my dogs about a half mile from my house in Monument, CO and I came upon the biggest, most beautiful white horse I had ever seen grazing in a field with seven other horses. Since this pasture was on my daily dog walking route and I had never seen these horses before, I assumed that a very rich family had just moved into the area with their very expensive horses. For a couple of months I admired the big beautiful white boy from afar until one day a woman knocked on my door asking if I could board a couple of her horses. She explained she owned the eight horses in the field up the road and that she had fallen on some hard financial times and needed good homes for some of her horses as all of them couldn’t stay out on a field with no shelter. 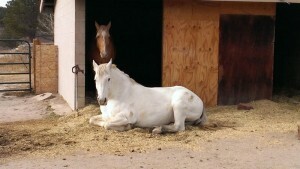 I took in two of her old timers on my property and asked if I could bring carrots and treats up to her big white horse. I learned that his name was Smokey Joe and I started my daily visitation. After about a week, Smokey knew the sound of my truck and would come running to the fence for his treats before any of the other horses. Before too long, I asked if I could purchase Smokey for my very own. My friend told me that some of her other horses wouldn’t be quite so challenging. However, there was something so striking about Smokey I just couldn’t imagine him going to somebody else and I knew we had already started to bond. The first couple months with Smokey were nothing like I imagined. My sister, Erin, said we should have named him Spooky as he nearly jumped out of his skin every time he saw a halter, a muck rake, or even a blowing leaf. Even so, he was very sweet to me unless I tried to ride him. My sister and I even taught him to blow us kisses for treats. After a bunch of tumbles off Smokey’s back and a separated shoulder, my Mom went in search of a horse trainer for me (probably thinking I would end up a parapalegic if she didn’t get me some qualified help). My Mom ended up giving me the phone number for Rob Norris, a very well known horse trainer in the area. That summer Rob worked with Smokey and me twice a week and we had homework the other five days. By the end of the summer, Smokey respected me and responded to my every command. Smokey and I are now able to take long rides down the Santa Fe Trail without incident. Riding on Smokey is like riding on a big comfy couch. The bond I have with this horse is nothing short of amazing. He comes up to the house and finds me through the windows once it is light out and blows kisses so that I will come out and give him treats. He is the first one to greet me at the fence line at feeding time. And, when he sees me go out for a run he waits at the fence line closest to the house until I return. When my sister and I were making practice batches of donuts at the house we tried feeding them to the horses. 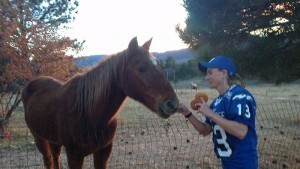 Out of all five horses on my property, Smokey was the only one that ate the donuts. Quite honestly, he couldn’t get enough of them! I’m not sure anyone could have predicted this horse would be so special. He is truly a gentle giant that loves and respects me, seems incredibly thankful that he is with me, and definitely deserves my attention. When my twin sister and I decided to open up a donut shop with a Colorado/Western/Horse theme, we couldn’t imagine not having Smokey as the face of Horseshoe Donuts. It all just seemed to make sense!